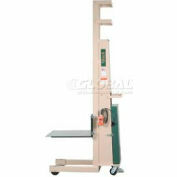 Increase worker productivity and reduce fatigue and injury caused by bending, stretching and lifting. 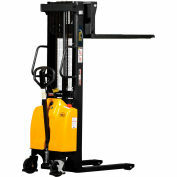 Rugged, space saving, design features a steer handle turning 8" polyurethane rear wheels for greater maneuverability in tight areas. Heavy duty 12 volt deep cycle battery raises and lowers loads easily. Built-in 15 amp automatic tapering charger. 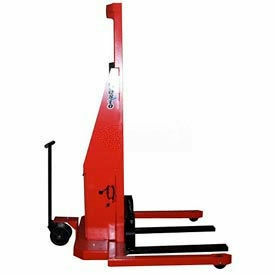 Pallet truck style forks (42"L x 6-1/4"W x 2" thick spaced 14" I.D. between forks) with 24" load centers. 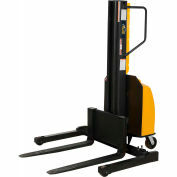 Straddle Models are for pallets - 50"W Models are for 48"W Pallets. 5" phenolic front load wheels and a 2" lowered height. Safety floor lock included on all models.